One of Chicago’s most iconic buildings is the Tribune Tower. Despite rising only 36 stories the tower has helped set Chicago apart as a living architectural museum. Its soaring Gothic spires and shrine-like lobby, complete with inspirational quotes, are by now iconic identifiers of the city and make it a thoroughly Chicago building. But the fragments embedded into the tower’s facade make it a thoroughly cool building. Where did those fragments come from? And, perhaps more importantly, is it possible to track down how each one was acquired? There are about 150 fragments from places all over the country and the world. Some of the most notable examples are a rock from the Great Pyramid at Giza, an emblem from the Holy Door at St. Peter’s Basilica in Rome, a fragment from the Great Wall of China, and a piece of metal from the World Trade Center. These fragments, or “relics” as the paper was fond of calling them, stretch across most of the building’s facade and range from eye-level to several feet above eye-level in height. From the outset I should note that there are not necessarily records for every stone that describes who acquired it and how. But there were essentially two ways every fragment found its way to the facade: it was either sent back to Chicago by reporters in the field, or was gifted to Chicago and the Tribune by a town or a person. Additionally, the stones and fragments were not gathered and installed at the same time; it was, and continues to be, a process. The most recent dedications were in 2015 when bricks from Wrigley Field and Comiskey Park were installed. He describes the process in probably the most detail the paper recorded. “Stones from the 43 states already have been collected, some after considerable research and exchange of correspondence.” (Emphasis added) The article then lists the origins of all 43 stones. That explains about where 28 percent of the stones on the Tribune’s facade came from. What about the other 107 fragments? Another clipping from 1952 listed all the stones then installed in the building, numbering 119 (including the 43 stones embedded in the WGN tower). The 1952 article notes that “Many of these stones, garnered from the important corners of the world, were presented to Col. Robert R. McCormick, editor and publisher of The Tribune, and others were obtained by The Tribune’s foreign correspondents serving over the globe.” Unfortunately, the article does not list which stones were gifts and which were acquired by correspondents directly. But the article does offer a valuable clue to the origin of approximately 16 stones that were acquired after World War II (the article calls them “Battle Stones”). Today most of these stones are found on the WGN side of the building. The fact that about 16 stones were acquired after World War II was essentially a continuation of Robert McCormick’s acquisition process in the aftermath of World War I. Katherine Solomonson, in her book The Chicago Tribune Tower Competition, writes that McCormick himself collected at least two “battle stones” from the city hall at Arras, France and a piece of the cathedral at Ypres, France. This origin story — that McCormick started the entire fragment collection process after World War I — is also corroborated by the Tribune itself. On the Tribune’s webpage documenting every fragment the brief introduction notes how McCormick “grabbed” some of the war-torn rubble for himself. 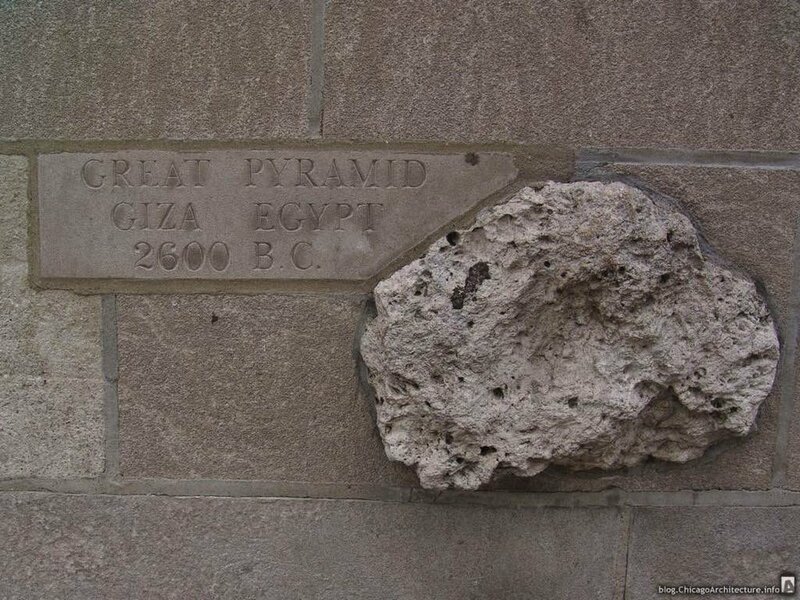 A boulder from the “Great Pyramid in Egypt” was forwarded to the paper by John Steele, London correspondent. Curiously, two tiles from Pompeii, Italy, were donated by a private citizen: Mrs. Otis Hann of Chicago. A stone from the Senate press gallery in the capitol building, as well as a granite rock from the Bunker Hill battle site, were “secured through the courtesy of John Mead Howells,” an architect. “A greyish rock from the powder tower of old fortifications in Riga, Latvia” were shipped by Baltic and Russia correspondent Donald Day. A stone from the Alamo in Texas was a gift to Chicago by Peter Molyneaux, “a prominent Texas editor” according to the Tribune. The stone was dedicated on “Texas day” during the 1933 World’s Fair. A stone from the home of Hans Christian Andersen was acquired by “The Chicago Tribune’s Copenhagen correspondent,” whose name the paper did not report. Similarly, a stone from the fortress walls at Cartagena, Colombia, was a gift to Col. McCormick from Cartagena mayor Vincente Martinez Martelo. A stone from the cathedral in Reims, France, was sent to Col. McCormick “by the people of France thru Henry Wales, head of the Tribune Paris bureau.” The paper noted that the Reims fragment was the 120th fragment to be installed in the building. Perhaps the most interesting fragments are chips from the ceiling of Cave of the Nativity in Bethlehem. Except for the moon rock (which has not been reinstalled since it left the Tribune Tower in 2011) it is the only artifact enclosed indoors, and within what can be described as a reliquary. The fragments I gave to Colonel McCormick are from the actual Cave of the Nativity. They were scraped from the ceiling of the cave by the Archbishop of the Orthodox church, which is situated directly above the cave and through which every denomination must pass to reach the shrine. Under no circumstances can the archbishop be identified publicly as the source. However it could be stated they came from a person who had access to the cave. Their authenticity can be guaranteed and proven by the archbishop and the mayor of Bethlehem, but the archbishop naturally would be reluctant to make it public. However the mayor, Issa Bandak, I am sure would confirm them. We were his guests in his home which is situated in a convent which is a part of the church of the Nativity for Christmas, 1949, when the fragments were given to us. In fact, it was his influence that brought about the archbishop’s unusual action. We went down the morning after and saw the white spot in the roof of the cave. In addition, we also got four tiny pieces of mosaic that were scraped away. We attached great importance to the fragments. It must be recalled the cave has been there for 2,000 years and it remains virtually intact. In that time souvenir hunters should have leveled the area for miles around, but miraculously it remained intact. I would like to emphasize these fragments came from the cave in which Christ was actually born and not from the immediate vicinity. Although most of the stones, fragments, and “relics” were acquired legitimately and “honorably” it does seem that at least this one was acquired under unusual circumstances. Other recent additions include tiles from the Sydney Opera House which were added in 2006, presumably after the paper got in touch with the Opera House (I could not verify this to be the case). This still leaves about 38 percent of the facade’s stones as coming from “unknown” sources, although I use that term loosely because, as we have seen, of the stones whose origins are definitely known, the vast majority of them were either gifts, sent back by correspondents in the field, or negotiated for to display. Only a handful were gifts from private citizens. It is fair to assume that the 56 stones that are “unaccounted” for were obtained in the same way. Beginning in 1914, when Col. McCormick took the first fragments from battlefields in France, the Tribune acquired and added stones into the building’s facade for a little more than a century. In all, 150 stones and other relics were added, and most of them have an origin story. In 2018 the Tribune moved to a new building, notable in its own right, but without historical calling cards from around the world. For now, the history the newspaper collected will remain part of the tower it called home for nine decades. This article would not have been possible without the help of the Chicago History Museum, John Russick, and Lesley Martin. Please support the Museum's mission here. If you enjoyed this article please consider supporting me on Patreon.